Sports fans of every stripe will want to “touch down” in the Dallas/Fort Worth area. Whether it’s NFL football, MLB baseball, PGA golf, or NASCAR racing, this region hits a “home run” when it comes to fun. 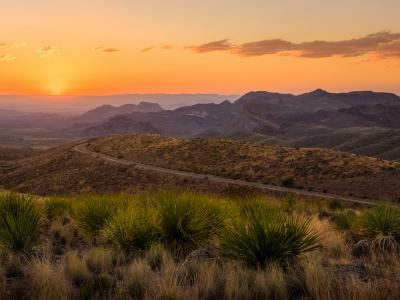 While cowboys, mavericks, and rangers played a big role in shaping the history of Texas, the Cowboys, Mavericks, and Rangers roaming the prairies today are just as influential—and much more famous. 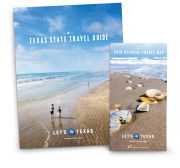 The Lone Star State loves professional sports, and has built a number of elaborate stadiums, fields, tracks, and courses on which to play. Visiting the Dallas/Fort Worth area provides a great opportunity to tour some of the best—and maybe even see the athletes in action. While American Airlines Center, home to the Dallas Mavericks basketball team and the Dallas Stars hockey team, is in Victory Park near Downtown Dallas, other major sports venues are about halfway between Dallas and Fort Worth, in the cities of Arlington, Grand Prairie, and Irving. Having an Ohio State fan in the family, there was no doubt that we’d be going to the first National College Football Championship game between the Buckeyes and the Oregon Ducks, to be played at the AT&T Stadium in Arlington. I’d been to the old Texas Stadium, but when the new, larger stadium opened in 2009, the Dallas Cowboys proudly made it their home. As we approached “the world’s largest domed structure,” I couldn’t help thinking it looked like some 25th-century flying saucer—all glass and steel and terrifically high-tech. Once inside, however, with all the other humans, I could see this was a place specifically designed with the fans in mind. The stadium seats 80,000, making it the largest in the NFL by seating capacity. Looking out over the world’s largest column-free interior, I couldn’t help but notice the huge HD video display that stretched the length of the field from 20-yard line to 20-yard line. Up-close views of all the plays—and instant replays—could be seen from any angle. As we celebrated the Buckeyes’ 42–20 defeat of the Ducks, a friend from Dallas suggested that we take the self-guided tour of the stadium on our next trip. We’d get access to the field to throw passes and spike the ball in the end zone, and we could get our picture taken on the famous star at midfield. Just down the street from AT&T Stadium is where the Texas Rangers play. 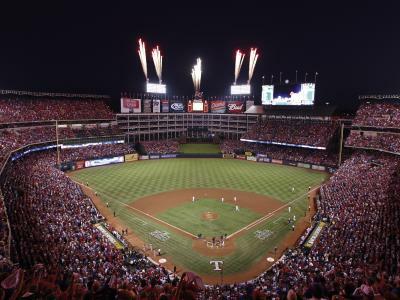 Opened in 1994, Globe Life Park was designed in a retro style, with red-granite arched facades and architectural elements from famous ballparks like Yankee Stadium, Ebbets Field, and Comiskey Park. Last year, we were lucky enough to have seats right behind home plate, just 50 feet from the batter’s box, which are among the closest in any major-league baseball stadium. This season, however, we’re happy in the all-you-can-eat seats. An air-conditioned, café-like area behind the upper home run porch, it serves unlimited hot dogs, nachos, popcorn, chicken sandwiches, and soft drinks, and is a big hit with kids of all ages. Rangers fans are loyal and loud. Standard attire is anything red, white, blue, and emblazoned with the traditional Rangers “T” for Texas. Once the game started, the cheering never stopped, and we soon found ourselves shouting out names and familiar baseball songs right alongside everyone else. Other sports-related stops in the Arlington area include Lone Star Park in Grand Prairie, where you can wager on and watch the horse races from an 8,000-seat grandstand. There’s also the Trinity Forest Golf Course in Dallas, where the AT&T Byron Nelson PGA Golf Championship takes place every spring. “NASCAR” was a foreign word to me until I met my husband. Now I can name several of the top drivers, as well as dates of the major races. That’s why we traveled to Fort Worth last year for the NASCAR Cup Series at Texas Motor Speedway. One of the largest sports stadiums in the country, Texas Motor Speedway can hold more than 190,000 spectators. In fact, four AT&T Stadiums would fit inside it. It’s that big. Besides the main attraction—a 1.5-mile racetrack—there’s the grandstand that is situated across from “Big Hoss”—one of the world’s largest HD video screens. Since many racing events are multi-day affairs, fans make use of several different camping areas, including tents, RVs, reserved, unreserved, infield, and VIP. We were fortunate in that our friend had purchased a spot in Burn Out Alley, an area right along the backstretch. Besides a gated space for the RV and full-service hookups, we had VIP passes to each Sprint Cup race, access to infield amenities, a concierge for groceries or catering, free Wi-Fi, and more. Sitting back in my comfy camp chair, sipping a slushy frozen margarita, the smells of a juicy smoked brisket wafting my way, I listened to the cars race by with the knowledge that—on this day, with these friends—we were already in the Winner’s Circle. AT&T Stadium is the only known football stadium in the country to have its own art collection. To enhance the structure’s unique architecture, Cowboys owner Jerry Jones commissioned works from 18 contemporary artists. Scattered throughout the stadium, these unexpected pops of color, image, shape, and theme delight fans and visitors alike.